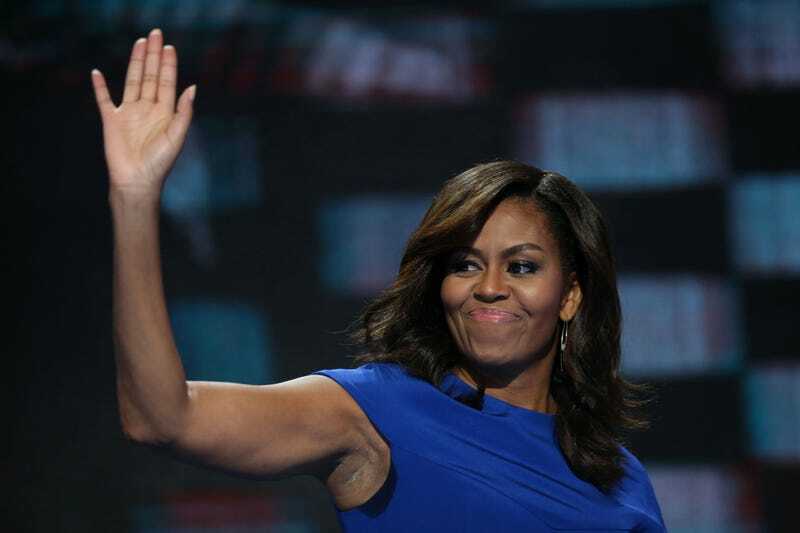 First lady Michelle Obama waves after speaking during the Democratic National Convention in Philadelphia on July 25, 2016. I am not unique when I say I have had a long and special relationship with first lady Michelle Obama. It started way back in 2008 when I got so many robocalls from her to get out and vote that I thought Barack might get jealous. In the last eight years, that nonexistent fantasy relationship has grown as I've watched her conquer the talk show circuit and advocate for healthy kids and military families, as well as be arguably the only member of the Obama administration who is resistant to Republican attacks. Just about every African American—Republican, Democrat, conservative or liberal—has formed a special bond with this first lady. A woman who, regardless of the invective and hatred swirling around her husband and his administration, has remained one of the most statistically popular women in American politics. Which is why, for one of the few times in my political career, I welled up last night while watching Michelle Obama give her last Democratic National Convention speech as the first lady of the United States. Not just because it was the best speech of the night, but because we will never see someone else like her in our lifetimes. The Democratic convention is a long and complicated place to spend time, let alone observe changing politics. Philadelphia is having a heat wave this week, everyone is sweltering, and the logistics of moving from various events to actually getting into the convention are like the worst citywide escape-the-room game you’ve ever been in. However, in the midst of all of this, there was one name that people were buzzing about throughout the day: Michelle Obama. While there were, of course, talks of unity on the ground, throughout the city it was FLOTUS whom more people were excited to see, more so than either Sens. Bernie Sanders or Elizabeth Warren, which is telling. People wanted to hear what Sanders had to say, they wanted to hear what Warren had to say, but folks just wanted to make sure that they were in the room when Michelle Obama got onstage to talk. If you have never had the chance to see Michelle Obama speak live, I encourage you, at some point during this campaign season, to drive, fly or run to see her. I am the last person to trot out the overused term #BlackGirlMagic, but there is something immensely captivating and awe-inspiring when you see FLOTUS enter the room. As she walked onstage, dressed in electric blue, I looked at the crowds sitting next to me on either side, and they all sat up in their seats as if their favorite teacher or aunt, or most respected mentor or boss, had come into the room. And when she spoke, the words that Michelle Obama brought to the audience were the perfect bridge between the angry Sanders supporters and the establishment Democrats who were already in for Hillary. As Michelle Obama spoke about teaching Sasha and Malia to be and do better than their father’s haters, the room was filled with cheers. I only heard one disparate voice from the back corner, and it wasn’t clear that it was a chant or a jeer, just a loud voice. Black folk, white folk, Asian folk, Arab folk and everybody else were not here for any Michelle Obama shade. I seriously believe that had anyone tried to disrupt FLOTUS’s speech, a few thousand people would have curb-stomped the words “I’m with her” into the heckler’s face. If there is any question about the universality with which Michelle Obama is lauded and loved, you only had to look at Twitter. Specifically Donald Trump’s timeline. He had slander to share about Sen. Cory Booker, Warren and Sanders. Not a peep about Michelle Obama. Even Donald Trump knows with whom he can’t pick a fight. As I watched the speech, I found myself welling up, something that has happened to me only once before in my years of reporting and analyzing politics. Not thug tears, not tears of joy. I had those tears you cried when you were 7 years old and your mom dropped you off for summer camp and you realized you weren’t going to see her again all summer. Those tears. The first lady’s words about living in a house built by slaves where now her girls play with dogs on the White House lawn were more than just a generational come-up story. It was a narrative that I will never hear again for the rest of my life as an American. We are not likely to get another black woman in the White House like Michelle Obama. Oh, we might get a black vice president and his wife. We might get some white man with a black or racially ambiguous wife living in 1600 Pennsylvania Avenue. But a working-class black woman from the South Side of Chicago who gives us representation and catharsis and hope and optimism and visibility like Michelle Obama? Never again. I just smiled and nodded in agreement. Michelle Obama is a classy lady, and the only one we’ll ever see who makes us feel proud, validated and confident all at once. I just wish it wasn’t so bittersweet to watch her last hurrah.